The 2019 roster of people making an impacton the lives and livelihoods of all Georgians. According to Henry David Thoreau, “Success usually comes to those who are too busy to be looking for it.” His assessment is an apt description of the individuals included in Georgia Trend’s 21st annual listing of the 100 Most Influential Georgians. Not only are they successful in their careers, but they also wield remarkable power and influence and have contributed to making life better for Georgians. On the following pages, you’ll find CEOs, politicians, college presidents and economic development leaders, among others, who have challenged, inspired and led efforts to bring about positive change in virtually every corner of the Peach State. Some are very public figures, while others work quietly behind the scenes. Many have helmed private businesses and helped shape industries, while some are heads of government, healthcare and nonprofit organizations. All are tireless and passionate in pursuit of their vision for a better Georgia. Selecting the most influential leaders is a daunting task and one that involves much discussion, mulling and refinement by the Georgia Trend staff. Our initial list typically contains many more than 100 names, and there are always last minute changes as a result of retirements, power shifts, late-in-the-year hirings – and, this year, delayed election results. However, we believe the final group represents the best qualities of leadership, power, character and influence the state has to offer. 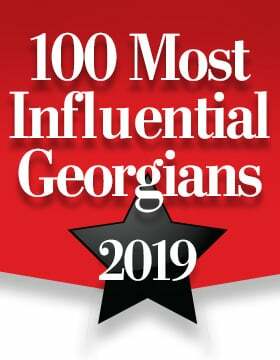 Along with the most influential, we’ve included a list of Notable Georgians on page 54. These are individuals who’ve also made a significant impact on residents’ lives. This article appears in the January 2019 issue of Georgia Trend.